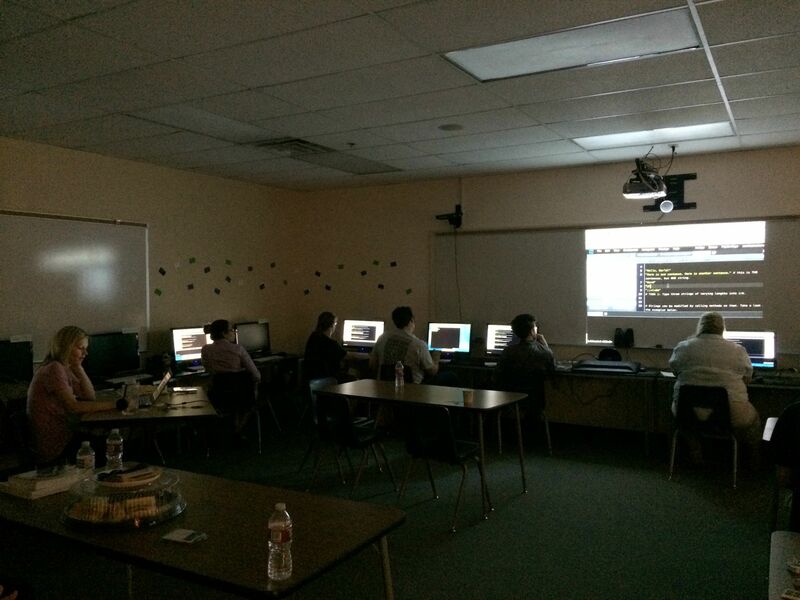 Sunrise Code Camp was a free, two-day coding workshop for beginners from 10am – 3pm on Saturday, June 14 and Sunday, June 15, 2014 at Eldorado High School in Las Vegas. By the end of the camp, attendees were going to have built their first interactive web application. The only requirement was a desire to learn. Laptops were provided by organizers. “Our goal was to introduce programming to people with little to no experience and teach them how to create a web application,” said volunteer Nick Shook. Rachel Warbelow and Nick Shook volunteered at RailsGirls in Los Angeles back in March 2014 and thought it would be cool to bring a similar event to the Las Vegas community. Attendees for the event were diverse. About half of the 17 participants were teachers from schools in East Vegas, and half were members of the community — from recent high school graduates to small business owners. Nick Shook wasn’t the only volunteer who turned out for the Sunrise Code Camp event. Rachel Warbelow and Nick Shook say coding opens up new opportunities for people in our community, whether finding a good job or helping their small business grow. It’s empowering to create something that can help others, change people’s lives, or provide entertainment. “We had a kid come who wanted to be a game developer and started dancing after he completed parts of the class,” Nick Shook added. What are the barriers present in our Las Vegas community to learning to code? Nick Shook and Rachel Warbelow agree money is often the barrier.